PENN has long been known to produce workhorse reels that are rugged and designed to go after the biggest and meanest fish out there. The Fierce II spinning reel line does not deviate from this model of constructing fishing reels. The Fierce II is not a bells and whistles type of reel. It works because of careful design and construction that comes from decades of experience. What this results in is a versatile spinning reel that can dish out as much hurt as it can take. And that’s not to say the Fierce II is a stripped down spinning reel. It has plenty of features, and all of them were placed into the reel design for a reason, to catch fish as efficiently as possible. In this article, we will take a look at some of the key features and characteristics of this line of reels and then discuss how these features translate to performance on the water and which applications it will excel. The Fierce II uses an all-metal body that provides tremendous support for the gear system. The spool, as well as the handle, are also constructed from anodized aluminum, and the heavy duty aluminum bail wire is going to stand up to twist and bending which eventually hinders line lay and casting performance. Spool capacity is not going to be an issue with any of the models. The 1000 model can easily spool over 100 yards of 6lb monofilament while the 8000 model can hold 230 yards of 30lb test mono! That is more than you will ever need, even with the biggest fish in the water. The spool is also braid ready, so you can maximize the amount of usable line you are spooling, and line capacity rings are also built into the spool which is extremely useful on the big models when you are dealing with fish making long runs. And while looks are not the most important factors in reviewing a fishing reel, we can’t help but mention it when reviewing the Fierce II. The name definitely fits this reel, with a black anodized body with red accents and smoke tinted aluminum. This reel was designed for heavy duty spinning applications, and its look matches the performance. The Fierce II is a bit heavier than other reels of similar size and that can be expected with the all metal body. And though the reel is heavier it does not mean that the reel is bulky. When paired with the right rod, the reel has extraordinary balance. A lot of casting can become a little fatiguing with the larger models, but that goes for all spinning reels at those sizes. The drag adjustment knob is very easy to adjust on the fly with audible clicks, and it also features directional arrows for those of us who can never remember which way it should go to tighten or lessen the amount of pressure. We also really like the extended handle and oversized grip on these reels. You never have to worry about knocking the bail with your knuckles while reeling and it is great for producing leverage on your quarry. For up to the 4000 size model, the Fierce II has a 6.2:1 gear ratio which we think is an excellent ratio for spinning reels. This paired with the excellent line retrieval rates, which are aided by the spool design, make these pretty versatile spinning reels that can handle a lot different retrieve techniques from slow jigging or dead shot to speedier techniques. With four shielded stainless steel ball bearings and precision cut gearing, retrieve on the Fierce II is smooth. The larger models have a slightly lower gear ratio at 5.6:1 for the 5000 and 6000 model and 5.3:1 for the 8000 model. With much larger gearing we would expect the gear ratio to drop and as we discuss later, the larger models compensate with an increase in cranking power. Even with a lower gear ratio, the larger models do have a higher retrieve rate due to the larger spool size which is needed to get large fish into the boat efficiently. The Fierce II shines in the power category. Even the smaller sized models can produce a tremendous amount of leverage on fish without sacrificing efficiency. These reels use heavy duty gears as well as a stainless steel main shaft that can withstand a tremendous amount of torque. 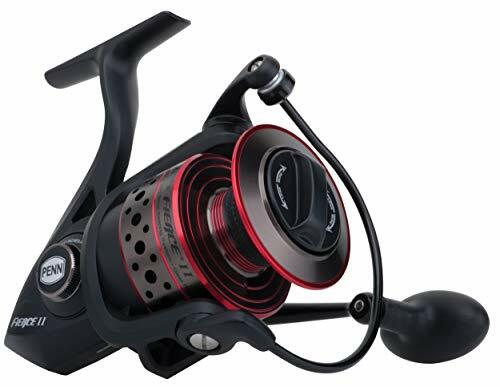 When you add this in with an all-metal body and side plates as well as an aluminum handle with oversized football handle grip, you can generate a tremendous amount of leverage for a spinning reel. The larger models that are available have more than enough power to chase after any freshwater species and a lot of medium to large sized saltwater fish. Casting on the Fierce II is much better than expected. While it is not leaps and bounds better than other spinning reels it tended to do well with reducing the amount of line twist. The spool lip design is angled enough so that you don’t get a lot of friction between it and the line. The Techno-Balanced rotor also plays an important role in the Fierce’s ability to get some distance on the cast. You don’t get much dead line on the spool because it lays line down well which also means less friction between the line itself on the spool. These reels are able to dish out a tremendous amount of drag pressure with its oiled felt stacked drag system. Where the drag tends to be an issue with these reels is the drag sometimes tends to lock up at the high end of the drag range. It doesn’t happen often, but it can lead to a broken line in some cases, especially when you are up in the 20-25lb drag range. Besides this, the drag performs flawlessly. Startup inertia is minimal, and you have excellent control of the drag throughout the drag’s range, and the adjustment knob is easy and even pleasant to use. Besides a couple of anomalies, the oil felt drag system is smooth and applies near constant pressure when the drag is engaged. There are times where you don’t need a high dollar, features heavy, finesse spinning reel. It’s during those times when you want a well built, rugged, affordable, and powerful workhorse reel to get down in the trenches with big fish. The Fierce II from PENN is a reel that falls into the latter category. And that doesn’t mean that this reel lacks in features such as smoothness of retrieval or casting ability because it can hang in there with some of the highest touted spinning reels out there. From panfish to trophy cats and tarpon, there is a PENN Fierce II model out there that’s going to be in your hands on the water for years to come.